Relationships can be like a scientist in a lab who ecstatically discovers a secret formula, only to have everything suddenly blow up. This is because getting to know someone intimately is one of the most risky and tricky things people do. And unlike most dangerous chemicals, there’s no standard method for handling estrogen and testosterone. Something which I feel people fail to talk about or prepare for is emotional chastity, by which I mean maintaining the right level of emotional commitment and intimacy at all stages of a relationship. Just as physical unchastity can lead to pain later on, so can emotional unchastity. One must be very conscious and careful how much and when you share yourself with another person.Think of getting to know someone deeply in the same light as getting to know someone physically. You can see how someone looks the instant you meet them, just as you can learn even the most intimate facts about them quickly. Yet as you get to know the person, you realize that even their physical appearance changes. In the same way, while the facts about someone remain the same, we intellectually see them differently based on our experience of the person, which is the greater part.Taking the analogy a step further, we don’t usually come to know everything about a person physically when we first meet them. There is a necessary progression of further “discovering” if you will a person’s physical form. To speed through this process (or skip it entirely) is dangerous at best. So too should the progression of emotional connection be properly timed. Maybe it’s tricky to figure out because it actually plays a bigger role in the discovery of a person than physical intimacy, and it’s harder to judge where the lines should be. For this reason, even greater vigilance should be given to emotional chastity. This vigilance can be termed emotional modesty—the protection of your own and other’s emotional state. It’s fun to come to intimately know someone in a relationship, but that intimacy cannot be peacefully maintained without the right level of time and commitment. So even when we feel drawn to get intimately close and attached to someone, emotional modesty keeps us from saying or doing things before the right time. This is important to keep in mind, because the actual right time will probably not be when something “feels right” for the first time. Just because there’s a full moon and a choir singing “That’s Amore” in the distance doesn’t mean it’s time to say something rash which you’ll probably regret before too long. It only works that way in movies. And even if that special someone makes your life feel like a movie, sadly it’s not. Remembering that will give you a better shot at your own real life happily ever after. A post on our Facebook page asking for clothing guidelines stemmed a debate on whether guys even have any business saying what’s modest for girls to wear or not (which is great, keep the posts and comments coming). Some people said God, not man is the determiner of what’s modest, so girls don’t need to ask men, and others said men should weigh since modesty is only for their sake anyway. I think there are elements in truth in both statements, but that they’re each incomplete. Guys-On-Modesty, wants to make it clear that our goal is to encourage and help girls see that there IS guys here in our world that DO appreciate Modesty. 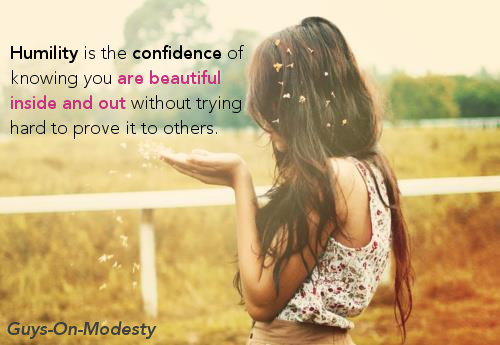 We appreciate woman that are modest is all areas of their lives, both physically and emotionally.Here in Guys-On-Modesty Blog, we are strong believers that Modesty is NOT just about clothing it’s a life style that reflects in the way you speak, act, and think! To begin with, I’ve never liked the idea that guys should dictate what girls wear, I think it degrades the girl and paints all guys as uncontrollably lustful. 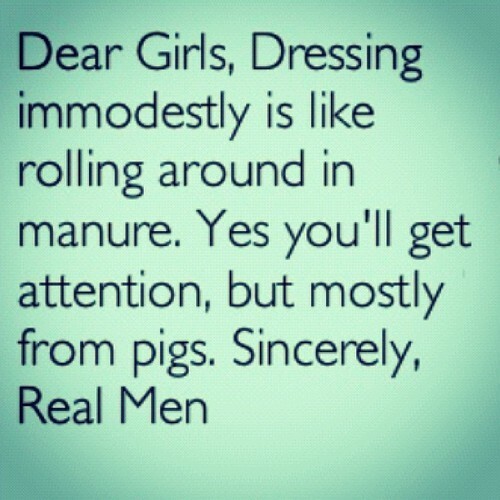 Modesty is its own virtue, not just something girls do for men. That being said, girls should be mindful of how guys will see what they wear, both out of courtesy to men trying to live chastely, and to protect themselves from men who aren’t. To this end, guys are the perfect resource to inform a girl how she’ll be looked at if she wears this or that, but their opinion isn’t law. Modesty is deeply related to humility. In fact, I think where humility is, modesty will be also. Unfortunately, humility is also a monstrously misunderstood virtue. People often treat it as a requirement to think poorly of themselves, but this is really a poor way to understand the virtue. Humility is about knowing yourself for what you are, not pretending you’re worse than you are just because. Now, as you seek greater perfection, and come to know yourself better, you’ll certainly discover you have a ton of flaws, more than you ever thought possible. So people without any humility think it means pretending they’re not awesome even though they are. People with a little humility think it means admitting they’re not awesome because they know they aren’t. But people with perfect humility don’t think about it at all because they’re too busy serving the best good of everyone around them to bother about themselves. Unfortunately, perfect humility is very hard to achieve because its arch-enemies, selfishness and pride, are like cancer—you can beat them in one place, but before you know it they’ve sprung up in another. Selfishness and pride are also wreak havoc on modesty. A lot of immodesty, from dressing badly to carrying oneself wantonly, springs from the desire for attention, to be important, to be sought after. Here again we see the internal play of virtue. The inordinate desire for others to think well of you is immodest whatever you wear. The girl who dons a modest outfit while hoping that people will notice her figure despite it isn’t any more modest than the girl who wears an immodest outfit in the certainty that people will notice her figure because of it. In fact, she is less modest than the girl who accidently wears something immodest because she’s not thinking of what others think of her at all (said girl is being careless though). On the flip side, with humility comes a deeper knowledge of who you are; your flaws, your strengths, and most importantly the knowledge of your worth as a human being. Any girl secure in this knowledge won’t feel the need to showcase herself boldly for the affirmation of others, but will instead feel inside her the value of what she has to offer someone worthy of it, and won’t want to advertise herself to the first taker. Be true to your self worth. 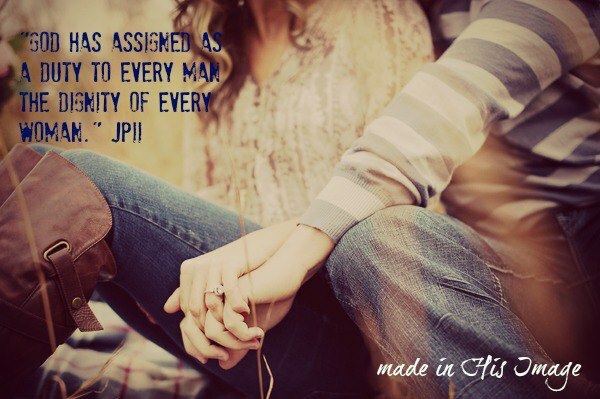 Ladies, you are worth so much more than provocative ways. Showing respect for your self, will help you find a respectful guy and friendships. The modesty debate runs sternly through any Christian circle, from the “modesty-means-dressing-fashionably-as-long-as-you-don’t-show-too-much” camp, which I more or less ascribe to, to the “if-it’s-not-a-denim-sack-you’re-going-to-hell” camp, which I find more repugnant and opposed to the human person than its total secular opposite. But in all cases, I think the debate is being argued from the wrong direction, or to be more precise, the opposite direction. Modesty, like chastity, has become a negative virtue, much more full of “thou shalt nots” than “thou shalts.” This is sad, because I feel looking at modesty or chastity from this perspective is a poverty of understanding, which, while it might avoid sin, leads to no great virtue. As Lewis notes in The Great Divorce, the passion of lust is but a weakly substitute for the true, good and pure sexual passion which may be born when lust is killed. What is wrong with secularism is that it never gets past lust. What is wrong with Christians’ response is that they never get past condemning the lust and moving on to ponder what the virtue actually is. If this is true of chastity, it is doubly true of modesty, which has most faithful Christians, many better than myself, tied in knots over trivialities that don’t begin to approach the real virtue. One hears long debates as to whether a skirt may fall above or below the knee (I don’t know who thinks knees are so alluring anyway), whether pants are quite feminine enough, and I don’t even want to touch the issue of leggings. I even knew one fervent Christian group that forbade its young ladies to show their collar-bones. I don’t know what they expect will happen to their young men when they greet the world at large with vague ideas of sexualized collar-bones. These measures, while they may avoid sin, also avoid any real comprehension of modesty, which I hold to be an internal virtue much more than an external. The same with chastity. Both virtues have to do with seeing value of the human person; modesty with recognizing your own value, and chastity with recognizing everybody else’s. This recognition is reflected in exterior actions—how we dress, how we interact sexually, etc. But such actions, or lack of action, are merely a reflection of the actual virtue, not the virtue itself. You can exercise abstinence without any appreciation for the multitude of people you aren’t sleeping with. But merely not dressing badly or not being promiscuous has about as much to do with virtue as not shooting your wife has to do with love. The purpose of this blog will be to explore the actual internal form of the virtue of modesty, and also chastity insofar as it relates to modesty. One last note, I don’t ascribe to any hard and fast rules on what is acceptable dress, although certainly some things are right out. Certain things, such as two piece swim-suits I see more as possibly unwise, but not necessarily wrong. I’ve seen bikinis worn with more perfect modesty than the most dour one-pieces. Denim sacks fail to realize the beauty of the human person just as much as thongs, possibly more so, for the one at least acknowledges its beauty even if it mistreats it, while the other would present the body’s beauty as something intrinsically evil, which is in my opinion the greater error.